If you’re simply looking for a new tennis racquet that’s easy on your arm, I highly recommend the Yonex Ezone DR 100. This racquet features superb vibration dampening and is one of the most comfortable racquets I’ve ever tried. 1 What is Tennis Elbow? 2 What causes Tennis Elbow? Nothing can be worse as a tennis player than suddenly developing tennis elbow. This debilitating condition can seriously ruin your enjoyment of the game as well as being very painful. Luckily, there is no need to despair if you start developing tennis elbow for there is a solution! Medical science has come a long way in understanding and treating the condition and there are tennis racquets for tennis elbow that you can buy now that makes it easy to repair and avoid. 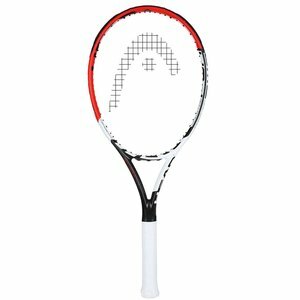 Comfortable and easy to use for men and women alike Combining power and control, the newest version of this racquet is very arm friendly. Perfect for players who want an arm friendly racquet with lots of spin Designed for stability and comfort, this racquet will let anybody with tennis elbow get back on the court. The most common question about tennis elbow is: exactly what is it? Most of us have heard of it or know someone who has suffered with it but don’t know the causes or how to treat it. Getting an understanding of the causes and cures can help avoid it as can choosing the best racquet for tennis elbow. According to WebMD, Tennis elbow is a condition where the outer part of the elbow becomes sore at the lateral epicondyle. The root cause is that the muscles and tendons of the forearm become damaged from overuse of the same motion. This in turn leads to pain and tenderness in the elbow. Although most commonly associated with the game of tennis, it can affect a wide range of people from golfers to carpenters. Tennis elbow is caused by a repetitive overuse of the same motion by the arm over a period of time. In terms of tennis this means that playing the same shots frequently, as you would in a game or practice, can bring tennis elbow on. The key problem is the repetitive nature of playing the same shots often as this can cause acute tendonitis of the exterior forearm muscles which in turn leads to the elbow becoming sore. It can also result in wrist pain such as when gripping the racquet or lifting it up to serve. Interestingly, recent research suggests that tennis elbow can be caused by mis-hitting the ball when learning to play as this puts strain on the forearm muscles and elbow joint. It is also thought that increased playing time can lead to the condition. This is mainly applicable to pro or semi-pro players though so amateurs need not worry. One of the most common misconceptions about tennis elbow is that using a heavier racquet can cause it and you’re better off with a lighter one to play with. Research has shown this is actually not the case. It turns out heavier racquets absorb more of the impact and vibrations of hitting the ball which is better for you as it’s not going into your body. One important point to note is that you shouldn’t buy the biggest and heaviest one you can find as this would be a bad idea. Instead you should use the heaviest one that is still comfortable to hold and play with for you personally. There is an old saying ‘Prevention is better than the cure’ and this is true for tennis elbow. The best thing you can do to stop it happening to you is to learn how to properly hit common tennis shots. As above, one of the main causes is poor technique or mis-hitting the ball regularly so learning from a professional will help avoid this. Making sure you are using the correct racquet on the court is also an important consideration. Your racquet must be the right size for you and the correct weight. Make sure that you are using soft strings like GUT strings and that the racquet has a lower string tension as this will reduce the impact on you when you hit the ball. Down below, we’ve selected the best tennis racquets for tennis elbow for you! If you have already got tennis elbow then the best advice is to take a break from playing until it goes away. Rest is the best cure for this type of condition so if you feel any pain in the elbow, take it easy until it feels better! Some people find it useful to visit a professional physiotherapist for some gentle joint manipulation if rest doesn’t work. The physio will manipulate the joints of the elbow and wrist in an attempt to cure the problem. In some cases some players will wear tennis elbow braces around their arm. These devices wrap around the elbow area and have been shown by studies to reduce pain and inflammation. 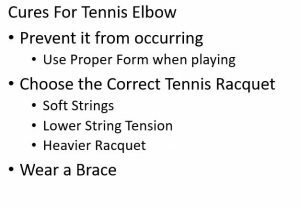 These braces can be very helpful to the tennis players who are trying to maintain their game and stop tennis elbow early. The Simien Tennis Elbow Brace is one of the best selling braces for tennis elbow on the market today. One of my favorite braces is the Simien Tennis Elbow Brace. This small and compact brace fits just under your elbow in order to prevent your tennis elbow from getting worse. With the Velcro construction, you can rest easy knowing that one size fits all. This brace for tennis elbows works by applying pressure to your elbow using a gel pad and it is one of the most effective(and well liked by customers!) on the market today. One of the best ways to prevent getting tennis elbow is to use the right tennis racquet for tennis elbow. This will be slightly different for everyone as we are all unique but there are some general things to look for when buying a racquet for tennis elbow. You will want to get a head-light one with a standard length (around 27 inches) and flexible frame as this will ensure the racquet absorbs the vibrations of hitting the ball and not you. It is also advised to get a racquet with soft GUT strings and one that has a lower string tension as this will also ensure the impact from playing is taken by the racquet. One of the best racquets out there for tennis elbow is the Yonex EZone DR 98. This has one of the lowest flex ratings(59) which makes the racquet flexible and easier to swing with. The strung weight is 11.4oz and it comes with soft GUT strings to reduce stress on the wrist and forearm when striking. The beam size is not too thick and tapers down to 19mm which again helps with making the racquet flexible. It is head light making the racquet take the strain and vibrations of hitting the ball rather than your elbow. Yonex has also included an oval pressed shaft with this racquet to help with control and flexibility. Yonex also included a feature called Quake Shut Gel which filters out unwanted vibrations going into your wrist and hand. With all of these vibration dampening features, the Yonex Ezone is one of the best tennis racquets for tennis elbow. This is a superb racquet to use when we are thinking about racquets for tennis elbow. It is -6 head light which makes it easy to maneuver and that the impact of striking the ball is taken by the handle of the racquet. The strung weight is 11.3 which is just about right in terms of it being easy on your arm when playing. In terms of flexibility(score: 63), the Wilson Blade 98 has enough give to ensure it’s comfortable to play with and absorbs the racquet on ball vibrations. 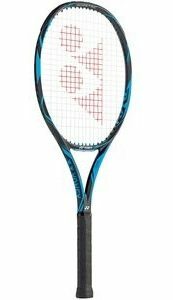 One of the best features of this racquet is that it has a big sweet spot meaning that it is easier to hit the ball properly. As we have already noted, incorrect striking of the ball is one of the main causes of tennis elbow and the Wilson Blade 98 easily prevents that. To cut down on vibrations in your wrist, Wilson has also fitted an amplified handle to the head of the tennis racquet. This results in a great advantage when avoiding or curing tennis elbow. Prince are well known for producing brilliant racquets and this one is no exception. As with the Wilson, it comes with all the features to help with any tennis elbow problems. The weight of it is really nice – it’s not too heavy but has enough about it to take the strain of playing and protect you. It is another head light product too so this helps in preventing undue physical stress on you when on court. The RDC Flex rating comes in at 59 which is fairly flexible and gives a nice feeling when you hit the ball with it. The strung weight is comparable with the Wilson at 11.3 and a length of 27 inches is perfect for reducing any shocks to the body that might cause tennis elbow. Being this length and size also makes the racquet very easy to swing and play with. I think this is actually one of the main plus points – it’s so easy to play with and ‘arm friendly’ so that it will stop any problems before they begin. 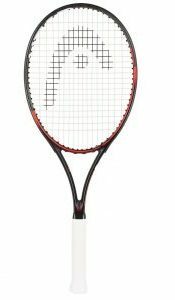 The HEAD Graphene XT Prestige racquet is a great product and a great tennis racquet for tennis elbow afflicted people. The head measures 98 sq inches which may seem a little small but in many ways, this is perfect for what we need. The smaller head makes the racquet easier to use and control your shots – this in turn takes away any problems caused by mis-hitting balls. The beam profile of it is nice and thin which leads to a flexible frame. It is another racquet that is head light with all the previously discussed advantages this brings. The weight distribution of this racquet is heavily optimized preventing torque from going into the wrist from the handle. 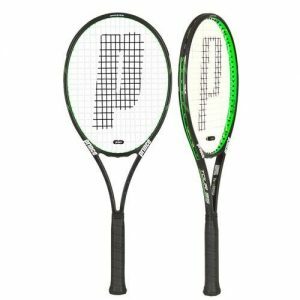 Overall the Head Graphene XT Prestige is a racquet for tennis elbow with the right amount of power, weight and control that makes it a joy to play with. A women who weighs 125 lbs, an 11.2+ ounces is too heavy. 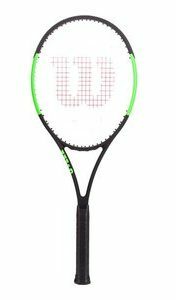 Any recommendations for a 10.2 unstrung racquet? I would recommend the Head Microgel Radical Midplus. While it clocks in at 10.4 oz unstrung versus 10.2, it is a very arm friendly racquet and provides a lot of power while reducing vibration to your elbow. I’m a 120lb, female, 3.5 player suffering tennis elbow. 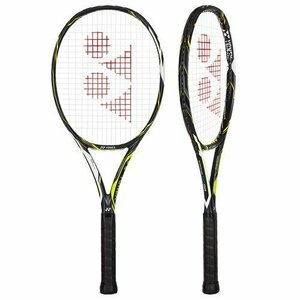 I’m trying to decide between Yonex Ezone DR 100 or 98. I like the spes better for DR 98, but like the bigger sweet spot on DR 100, any suggestion? If you’re a 3.5 player, I would highly suggest the Yonex Ezone DR 98. It provides enough forgiveness in the frame to avoid jarring when hitting off center shots if that’s your main concern. Have you played with a 98 inch head size before? It’s not a major difference but it does give you slightly more control. As you move up in the rankings, I would suggest focusing on control more than power ESPECIALLY if you’re suffering from tennis elbow right now. The forgiveness that DR 98 provides you and the control I believe will suit you well. Let me know what you end up choosing! Thank you for the suggestion. I’m thinking about testing a few racquets: Yonex Ezone Dr 98, Head Instinct MP, Head MXG3 (like the feel), and Volkl Super G V1 Pro. What do you think my choices? Thank you! Personally, I really like the Yonex Ezone DR 98. 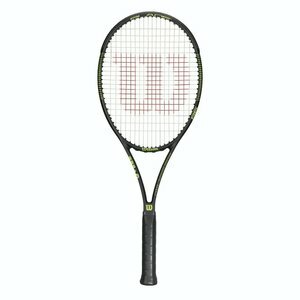 It’s a very comfortable racquet but very powerful on the court. However, if you personally like the Head MXG3, go with that racquet! 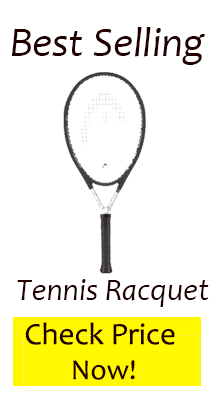 A large part of choosing a tennis racquet is a personal choice for your specific playing style. Had severe tennis elbow so I quit playing for 6 weeks, used a flex exercise bar and went to a Pro Kennex Ki 5 315 when I started playing again. It was hard to get used to the heavier racquet, but have used it for years and tennis elbow has not returned. This racquet is worth a mention. I haven’t actually heard of this brand before. Thank you for bringing it to my attention! I’ll look into it further. I am a 4.0 male player, how would you rate the Wilson pro staff 97 ? I like the Wilson pro staff 97! However, for tennis elbow, it is not the best racquet. The Pro Staff is a very stiff racquet which means that it will transfer all of the vibrations from hitting the ball straight to the elbow. Definitely not the best for somebody experiencing tennis elbow. what the stiffness of the YONEX EZone DR 98? It has a flex rating of 62 which means it is very arm friendly. While we enjoy picking various racquets to help tennis elbow, my 30 years of experience says that each and every player is unique. The combinations of frame and string is endless. Go to someone who understands technique, frame stiffness and sweetspot. 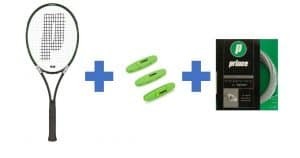 In addition, you will need CUSTOM stringing so pick someone capable of delivering the full package. She is 9 years old ! Any recommendations for suitable racquet for her ? And the how can i choose the right size ? At that age? How much is she playing? Being so young, she may just be playing tennis too much. Or swinging the racquet with the wrong form. Make sure her form is good before you look for a different racquet. I don’t think it’s the tennis racquet with her being so young. I would focus on practicing her form and taking time off from playing tennis. I have had many medical tests to discover a crack in the right elbow! Hi, I am a 162 cm male weighing 140 lbs. I use a 11.4 oz Wilson k factor unstrung which I bought few years back.. it has definitely not caused any elbow. Please suggest ideal string tension. Also should I change my racquet? Pro Kennis racquets are probably the best racquets for anyone who has tennis elbow. The beads really do work! As with anything there’s kind of a sliding scale between arm friendliness and stiffness. The less stiff racquets make your arm do more of the work which some people don’t like. They find it aggravates the injury. Overall, if you get a racquet that is too stiff, it tends to transmit the shock of hitting the ball straight to the arm. Obviously this isn’t good either. Most people should go with a less stiff racquet. That’s the correct answer for 90% of people. However, some people should go with a slightly stiffer racquet like the Pro Kennex. These racquets provide a good mix of sheltering your arm from shock while also doing a lot of the work of hitting the ball and generating power for you. had tennis elbow after using Wilson Blade Serena Williams. Went to chiro & after research switched to Pro Kennex (after Tennnis Warehouse rec) and have almost no problems despite playing a lot. I will say I usually use cold pack after playing. Highly recommend Pro Kennex despite their being under the radar. Hello I am a female suffering from tennis elbow for the past 8 months. I have to stop playing all this time because had a partial fracture of the tendon. I used to play with a Babolat Aero with 300 grams. I play more or less 3 times a week. Learned to play when I was little and now I am on my 40’s. Have a very powerful game and my forehand is with one hand. That is how I got injured I think. I really like the Wilson Ultra 100L. It’s combination of maneuverability with a big sweetspot makes it a great choice for you. I had a tennis elbow so I quit playing for a few weeks. 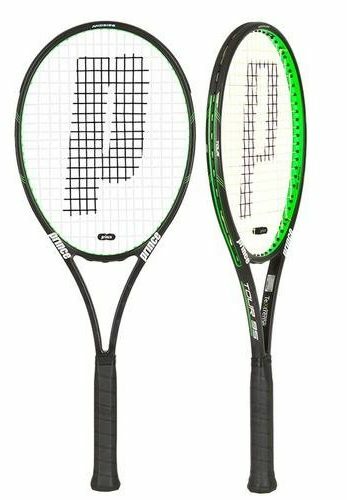 After that, I tried some recommended rackets for the tennis elbow, and finally went to a Pro Kennex Q Plus Tour 300 (FLEX: 63RA). I have used it for a year and tennis elbow has not returned. This racquet is worth a mention. I’m playing with babolat pure control strung at t0, Blue Hitter Blue Rough strings Which is co poly because I like how it gives me more topspin. However, after years of playing with it, I’ve suddenly developed TE. I should mention that in 5 weeks this summer, I played twice without any issue until this week. Puzzled whether it’s the set up, or not. Not sure if I should change rackets and strings or just string same racket with Gut? Any thoughts would be appreciated. If it doesn’t keep happening, it may just be overplaying. Take a break and make sure to go through all of the recommended steps for helping tennis elbow. Use a brace, make sure to stretch it in your off time, and alternate between hot and cold treatments. Everyone keeps mentioning Yonex DR 98. But I can’t find it anywhere to buy or demo. Is this being made or is there a newer version on the market? I’d love to try this. Also what do you think of babolat excel on mains and crosses once I find an elbow friendly racket? Hi! It’s available on Amazon! I have not seen it in many stores as the most common stores tend to push the bigger brands like Head, Wilson, or Prince. Hi, when you say GUT strings, do you mean synthetic gut, or natural gut? I typically use synthetic gut but that’s because I’m cheap haha. The only difference is that natural gut hits a little bit smoother and is more expensive. Typically going down a grip size is not the right move. First, I’d recommend to take some time off. Try some different racquets like the ones here. Have you tried a brace? Hmm, how much have you been practicing? You may just need to take a break. How long have you had the racquet? Did the tennis elbow develop right after you got it? If the problem is the racquet, you would see the tennis elbow develop pretty quickly while playing.